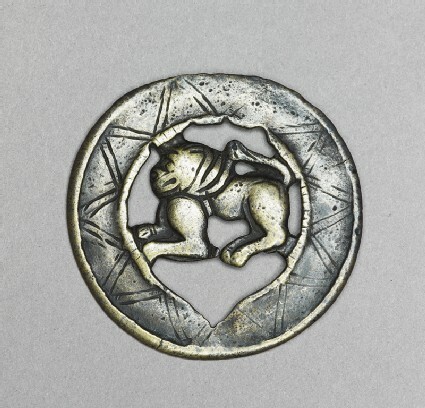 In colour and form, this tokcha with a central lion motif departs from the usual norms. Its alloy is whitish, due either to a high proportion of tin or an admixture of silver , and also it is not flat: the lion figure has cavities in the body on the reverse and the front has been modelled. The circular rim however is completely flat and smooth, with an incised pattern of interlocking triangles. The lower rim of the circle is worn and has been cut in an indentation. 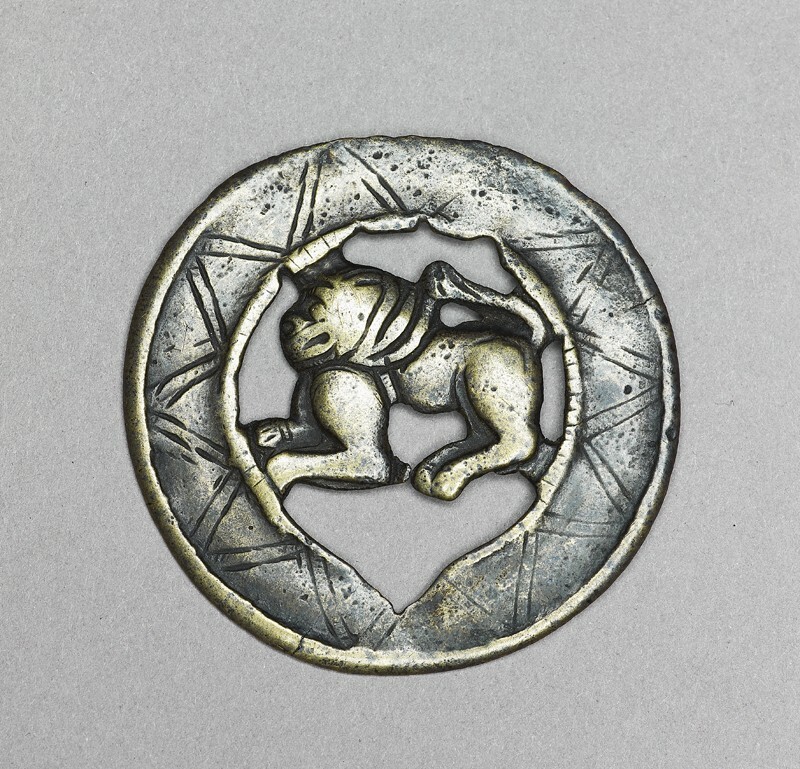 This feature and the two sideways-oriented prongs on the reverse suggest that the tokcha served as a belt buckle. The central lion is in profile, as if poised to leap forward. He has a very full mane and his large haunches give the impression of great strength. The lion's face and fur bear no archaic markings . It is therefore probable that this tokcha reflects the Tibetan adoption of the lion in its Indian Buddhist context, as the symbol of the Buddha Sakyamuni and his doctrine. Several other lion tokchas showing a similar configuration have been documented . 1 See comments by John Twilley on tin and silver in alloys in west Tibet, quoted in Heller, 'The Three Silver Brothers'. 2 Compare cat. nos. 16 (confronted lions) and 18 (clasp with lions and vajra) above, for archaic Tibetan lion types. 3 Anninos, 'Tokches: Images of Change in Early Buddhist Tibet', pl. 15.